Posted @ 9.50 pm....After an hour's drizzle, Rainfall has stopped here since 9.30pm...please send other reports too. As yet the forecast seems ok -:) will be putting up a forecast for Mumbai again tonite. Meanwhile, the UAC at 700 hpa has moved over the Gujarat Peninsula, and at 1200 hrs UTC Monday, lies over the Saurashtra region. A Low has formed in the Bay at 998 mb, off the North AP/Orissa coast. Tracking will presently be along the axis..
Rainfall from 8.30am to 8.30 pm Monday: Scruz 148 mms, Colaba 80 mms.Official observatory readings. Same period AWS: Goregaon 220 mms, Dahisar 172 mms.Chembur 122 mms.Dadar 108 mms. Way up Vasai recorded 85 mms, Dahisar 77 mms, and Thane 80 mms. To the east, Barvi Dam at Badlapur 90 mms, Navi Mumbai 55 mms (to be confirmed by the sources). In the city, Chembur 33 mms, Andheri 25 mms, Malad 55 mms. S'Cruz AP 25 mms and Colaba Observatory 16 mms. Vagaries (Mahalaxmi) 21 mms. The purpose of putting up the figures are to show that the heavy downpours and intensities are fluctuating in different parts of the City. Monday early evening should see another spell of heavy rains in the Eastern and Northern suburbs. A short burst of rain in Central parts possible around late evening/night. Rainfall decreasing after 8/9 pm to a drizzle, as convection could reduce. Tuesday may be less than half the amount of rainfall as compared to Monday. Brightning up in the day. Mumbai Dam figures of Monday/Tuesday comparison will be up tomorrow. Thane rains also reducing from night, infact evening. Till yesterday we were aware of the west coast trough strenghening. 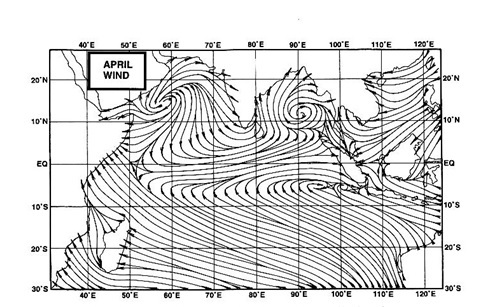 Now, it was the formation of a vortex off the Mumbai coast at 700 hpa that brought about inland convection, within a 100 kms radius of Mumbai, but to the east. As we discussed in the morning, the semi circle started forming inlad to the east after morning hours. Good (low) condensation levels (see map) and favourable conditions, and fast deepening, depth of the vortex at -70, brought violent storms. Again at 2.30pm, high thunder clouds are seen developing around Matheran and to the NW of it. The cloud height has again reached 15 kms. Above are charts of the vortex at 00Z UTC, condensation levels and a close up of the region at 3 kms . Thanks for the update sir. But what is the forecast for Mumbai and surrounding regions for tonight and tomorrow? what is lakes levels before today rain & what it is @ 8.30am on 4th sept 2012 could you pl put up both days figur? My colleague at work reports of water logging at Vasai, the current rain reported from there is 'heavy'. Meanwhile the rains which had slowed down have again picked up at Andheri, it's heavy currently. Rajeshbhai, as requested by Anon, what is the forecast for Mumbai from now and tomorrow? @ Rajesh Sir.Nice explanation with charts & we Kalyan to Badlapur to Karjat belt that is east of Mumbai were experiencing convection from last night 11pm onwards only . And from today early morning intensity was severe. Now from 2pm onwards thundering has stopped and steady drizzling going on here. Badlapur records 133mms rain from 8.30am till 3.30pm today. @ Rajesh Sir. Yes rain variations is there in very small distance also ! I was too very suprise to see that Barvi Dam, Badlapur which is 11kms ENE from main Badlapur city has got just 3mms rain ending 8.30am today morning of past 24hrs rain data ! But actually in main Badlapur city it was pouring heavily last night and also in early morning 5am period so I measured 65mms ending 8.30am today morning(and main Badlapur city is just 7kms that is closer to Matheran mountain range)& even ambernath got 52 & murbad 32mm ending 8.30am today morning. But barvi dam is just 3mm so just unbelivable to notice such variations in rains !! Hi Rajeshbhai, the heaviest rain so far for the day at Andheri has since 4:30 PM, it's raining consistently heavy since then. The Doppler radar shows only a small patch now covering Mumbai upwards of Bandra with heavy rain, rest of the regions look rain free (or with drizzle) right now. Total rainfall today from 00 am in Thane is 127 mm and season's total has crossed 1600 mm. @ Rajesh Sir mine previous comment got deleted for 2times !! Any specific reasons !! Badlapur records 135mms rain from 8.30am till 5.30pm today. "VABB 031210Z 00000KT 0600 R27/0700 +RA SCT008 SCT015 FEW030CB OVC080 25/25 Q1001 WS RWY27 NOSIG" interesting metar report at mumbai santacruz airport. Pouring in Dadar for last 90 mins.In between thundering also. ABP news reporting that all 3 local trains lines are running 20 mins late. Good that you expecting this rain to subside by 8 pm. whats was the reason of such cloud movement can you explain rajesh sir..
For the first time this year in 24 hrs of 8.30 to 8.30 AM slot we have over 100 mm rainfall this year!! Tremendous downpour here at Andheri, might find it difficult to reach as close as Juhu from here currently, I can see water begining to gather on the road below. First heavy rumble of thunder in some time. I agree with svt, hoping that this subsides now a little bit. anon: The wind lower winds have been W and NW throughout the day. At 4.00till 5.00 pm they were E and NE. This was due to the massive cumulo-nimbus cloud. Now this cloud sent a downdraft from the cloud top, a fact i mentioned as missing in the morning blog (on Mumbai Page). As it comes from the cloudtops, the temp on the ground dropped to 24c at 4.30 pm from 27c. Ganesh: colaba had 112 mms in 24 hrs on 1st sept. As yet, till 7.00pm none of the 2 observatorys have reached 100 mms. IMD has put red alert over Maharashtra (Mumbai), south Gujarat- very very extremely heavy rain. Hope for Mumbai 2005 will not repeat. They say sep-05 is the day. Dry weather today in Ghaziabad with partly cloudy sky in the afternoon. this has to be easily above 120-130MM rain for mumbai...highest of the season??? Also could u revise the forecast for tomorrow pls?? As per MCGM site, IN LAST 3 HOURS Dadar got 85 mm, Airport 95, Chembur 127 & Bandra 128. Phew! Thats lot of rain. I was expecting 150 mm of rain for 3 days we got that in just one day. Atleast 1st time this season I aome close to getting this right. Thank god I came home early or would have got stuck in traffic. Can you believe this? SPIN has overtaken CI with a lesser deficit for the season till date!! Infact SPIN is now in the lead with the minimum deficit (8%) of all the four zones. And E&NEI which started with a bang in June is now lagging behind with 15% deficit. Yesterday till 8.30am today SPIN got 16.1mm rainfall against normal of 4.5mm which is +259%. Nine out of the ten subdivisions got excess rain. All India 20 of the 36 subdivisions got excess rain. SSET - the SOUTH is the leader now, so cheer up!! Of course Andhra is doing much better than the other states.. but we still have a lot of time for Bangalore and rest of Karnataka to catch up. Goregaon received 220mm in the last 12hours out of which 145mm is in the last 6 hrs. !! Shades of 26th July 2005!! @rajesh panvel has received very heavy rain thruout the day!!! !we wud have touched more than 100mm ,,do tell me the readins!! Badlapur records 138mms rain from 8.30am till 8.30pm today. Junaid: as per unofficial reports, the rainfall in Panvel till 8.30 pm was 110 mms..yet to confirm. You once again got it right. Rain reduce to only drizzle after 8:15 pm. Now it has completely stopped. Goregaon 250mm is faboulous - lions and tigers of Goregaon forest hills will come to Areay Milk colony!!!! With low over Gujarat/Saurashtra - we can except dump of 400mm of rain in 24hours. GSB - I still have my doubts if rains will ever come to Bangalore - September is hotter than previous 2 months. Weather blog next UAC over Maharashtra will be heaviest season has ever seen with Mumbai in RED RADAR!!!!! 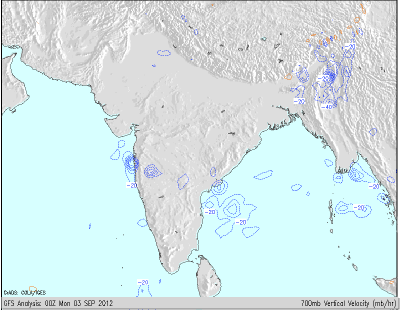 with september being so vigourous will monsoon axis ever come down to south??? Korean model predicts extreme rains over Maha/Guj in october?? @sset: which weather blog has suggested the next UAC to bring the heaviest rains in Mumbai, also can you please share the link to the Korean model which is predicting 'extreme' rains in Maha / Guj in October? Rain has reduced to a trickle at Juhu, very much in line with 'Vagaries' predictions. Awaiting the forecasts for the next couple of days. Interesting comments by a few readers pointing to possibilities of 'extreme' events for Mumbai.